Achieving sustainability is important for the survival of the planet and human society in the 21st century. Sustainability science is the holistic, transdisciplinary academic discipline dedicated to tackling this issue. 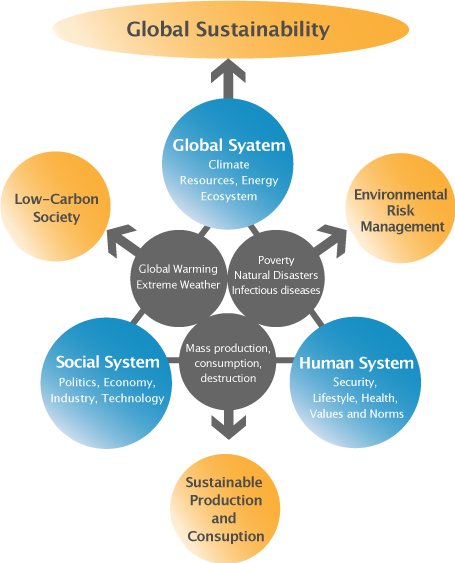 Through the “Program for Encouraging the Development of Strategic Research Centers” (Special Coordination Funds for Promoting Science and Technology), the Integrated Research System for Sustainability Science (IR3S) created a strong network of leading Japanese universities and research institutions and engaged in activities aimed at illuminating phenomena and resolving problems related to global, social and human systems and their mutual disruption (see Diagram 1). When the program period at IR3S ended, the Sustainability Science Consortium (SSC), a general incorporated association, was established to further develop existing research, education, and public outreach programs and to strengthen coordination between national and local government, corporations, NPOs and other organizations while developing practical measures aimed at technological innovation and social transformation. SSC aims to lead the way in capacity-building through research and education based on sustainability science; to conduct public outreach on sustainable community development by including the general public within its network; and to develop practical measures in collaboration with national and local government, corporations, NPOs and other organizations that will help to achieve sustainability. The Integrated Research System for Sustainability Science (IR3S) spent five years (2005-2009) creating a strong network of leading Japanese universities and research institutions and engaged in activities aimed at illuminating phenomena and resolving problems related to global, social and human systems and their mutual disruption. When the program period at IR3S ended, the Sustainability Science Consortium (SSC), a general incorporated association, was established on May 19, 2010 to further develop existing research, education, and public outreach programs.